My Life in Stills and Syntax: This is why I live in Florida..
Now that the Christmas holiday, all the bustle, and visitors have been and gone I just wanted to provide a brief synopsis and let you know how I made out with my “All I want for Christmas” list. Christmas Eve is one of my favorite nights of the year, right behind any night that includes a theme party and my birthday of course. I guess this is because it has always been the night when my family got together to celebrate Christmas (Christmas morning was usually reserved for sleeping in and as we got older for nursing a hangover). I remember my huge catholic family all coming to our house for Christmas Eve and how it was one of the few times a year that my dad would uncover the pool table in our family room (never understood that but it made that night all the more special). As I got older I remember being the ‘bartender’ mixing up Tom Collins cocktails for my Momma and my aunts (and usually an extra one for me and The Gray Lining to sneak off and drink somewhere). I complain quite a bit about the cold weather that I grew up in but there is a certain amount of convenience and country charm to being able to leave all your beers and pops out on the porch to stay cold for drinkin’ (damn right I said drinkin’ and damn right I said pop, I'm talkin' about the country after all!). While I grew up loving Christmas Eve in the blistery north, there is in fact a reason I moved here….year round summer. Ok, perhaps it’s not summer year round, those who don’t live here might tell you there is no season change, but when I woke up this morning I did the same sprint to the shower to get under the warmth of the hot water just like I did on cold northern mornings. 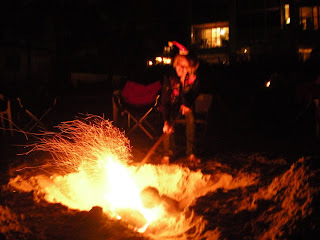 My Christmas Eve in the past couple years has been a true Florida one, it has been spent around a beach bonfire, enjoying great food, and great friends, plus…I don’t have to sneak my Tom Collins or any other cocktails anymore, which is ver nice. Christmas day was spent traditionally, opening presents and as it turns out those I hold dear did a pretty good job with my Christmas list. an IU slanket - CHECK! a winning softball season for "I'd Hit That"
For those items I didn’t come away with, there’s always my birthday! Merry Christmas to all, and to all peace out!